Description: The inflorescence is a large, solitary composite flower head usually on an erect stem that is woody at the base. The head has a fringe of many yellow ray florets each up to 5 centimeters long surrounding the disc flowers. Leaf: The silvery woolly leaves are up to 10 centimeters long by 8 wide and are spade-shaped to oval to diamond-shaped. Notes: Enceliopsis covillei is a rare species of flowering plant in the daisy family. It is endemic in Inyo County, California, where it is known only from the rocky slopes of the western Panamint Range in the Mojave Desert near Death Valley. 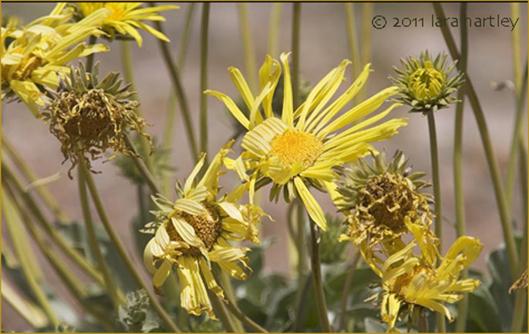 It is included in the CNPS Inventory of Rare and Endangered Plants on list 1B.2. This photo was taken April 2, 2005 in Wildrose Canyon in the Panamint Mountain range with a Canon EOS 10D, with a 300mm lens and 1.4 teleconverter.